A total of 47 suspects, including 2 men from Sugar Land, are now in custody following the return of a 43-count indictment alleging drug-trafficking and related crimes in the Houston and Galveston areas. The case will be prosecuted in the Galveston Division of the Southern District of Texas. U.S. Attorney Ryan K. Patrick made the announcement along with Drug Enforcement Administration (DEA) Special Agent in Charge Will R. Glaspy, Special Agent in Charge Mark Dawson of Immigration and Customs Enforcement's Homeland Security Investigations (HSI), Chief Vernon Hale of the Galveston Police Department (GPD), Special Agent in Charge Designee Brett Rovey of Internal Revenue Service - Criminal Investigation (CI) and Deputy U.S. Marshal Alfredo Perez of the U.S. Marshals Service (USMS). 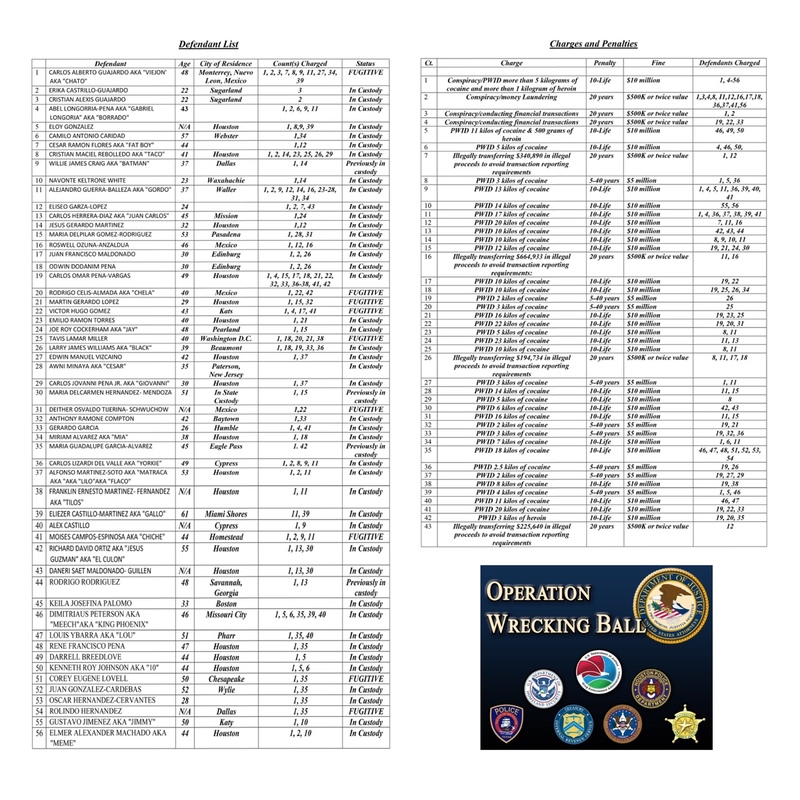 The arrests are the culmination of 31-month Organized Crime Drug Enforcement Task Force investigation (OCDETF) dubbed "Operation Wrecking Ball." "This operation is the result of countless hours of hard work by officers and agents from many different agencies," said Patrick. "OCDETF is uniquely able to marshal resources for complex cases. 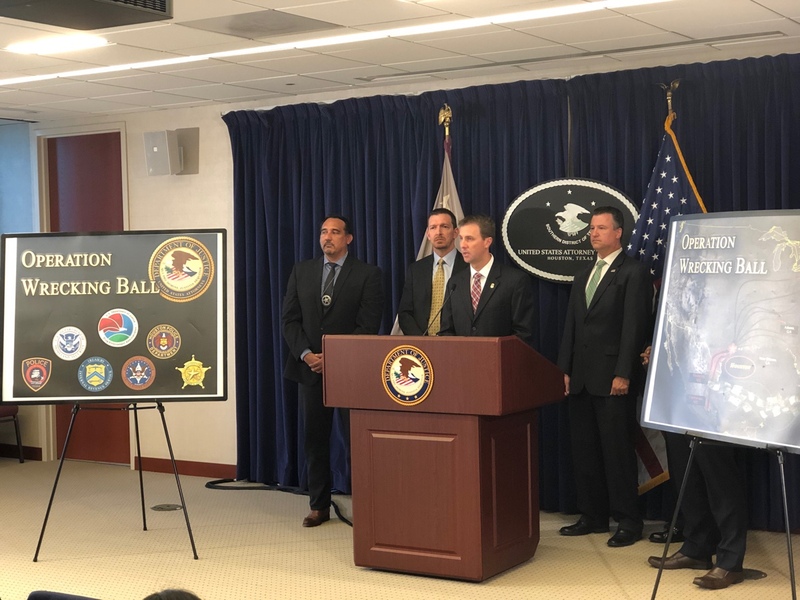 The Department of Justice is committed to disrupting the work of international cartels and other drug trafficking organizations. This case also is reinvigorating my office's commitment to Galveston. For the first time in decades, we have a full time prosecutor on the island who is focused on cases that will have a local impact in Brazoria, Chambers, Galveston and Matagorda counties." "Today's enforcement operation marks the culmination of a 3 ½ year investigation targeting one of the largest suspected drug organizations seen in Southeast Texas in decades," said Glaspy. "The success of this investigation was possible only because of the many law enforcement agencies dedicated to protecting our communities in the greater Houston/Galveston area from those who prey on them." 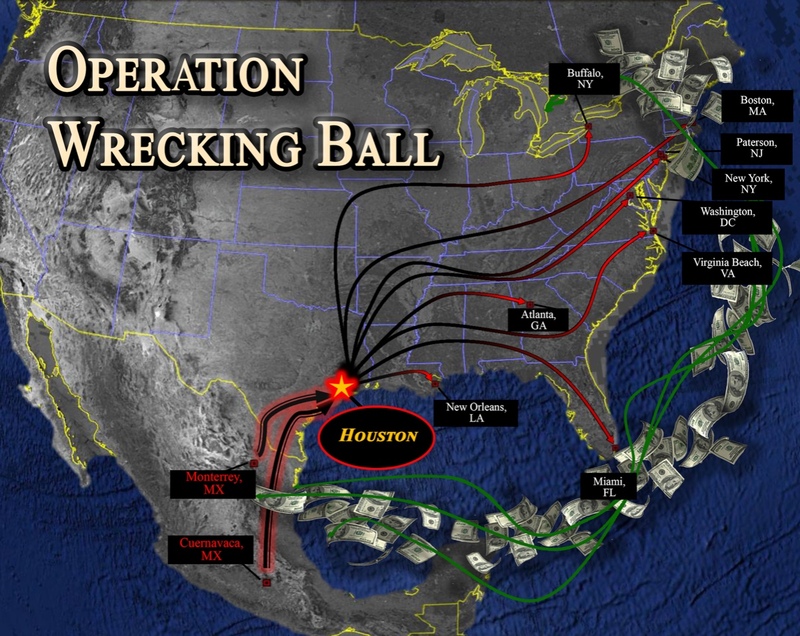 "This case is a clear example of the kind of federal matters we are bringing to the Galveston Division." The DEA conducted the investigation along with HSI, Houston Police Department, IRS-CI, USMS, GPD and Galveston County Sheriff's Office with assistance of the Texas National Guard Joint Counterdrug Task Force. Assistant U.S. Attorney Kenneth Cusick is prosecuting the case. $ 3.1 million dollar seizure? Great going ! WOW ! Two residents of Sugar Land caught in the Bust ! !